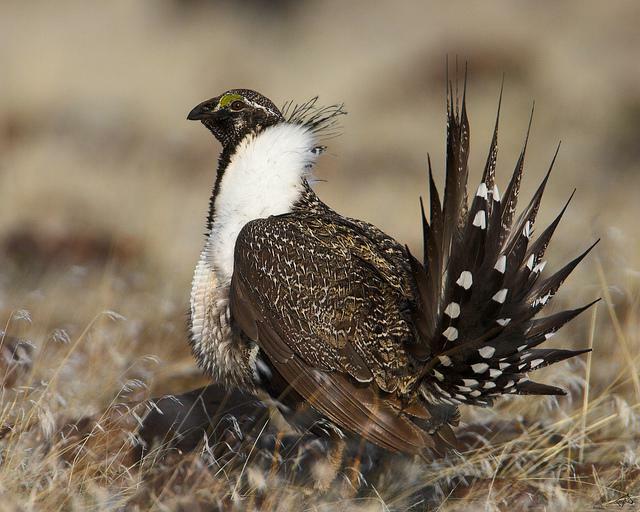 According to a new report from the Western Association of Fish and Wildlife Agencies (WAFWA), the number of male sage grouse in the western U.S. has increased by 63 percent over the last two years. Sage grouse used to number in the millions, but the bird's population has taken a nosedive over the last century. The U.S. Fish and Wildlife Service is preparing to make a decision in the next several weeks regarding whether or not to list the sage grouse under the Endangered Species Act. The report from the western states comes as the U.S. Fish and Wildlife Service prepares to make a decision in September about whether or not to list the sage grouse under the ESA. A previous report by the Pew Charitable Trusts showed sage grouse numbers declined by 56 percent between 2007-2013. Natural resource development, wildfire, invasive species and cattle grazing practices are some of the threats to the bird and its sage brush habitat. Hear the on-air version of this story. In a press release, WAFWA explains that the study was done to help inform the U.S. Fish and Wildlife Service before the federal agency decides whether or not to list the bird. Idaho Fish and Game and other agencies like it make up WAFWA, and they want to keep the bird off the list. The report and its findings do not come as a surprise to Boise State University political scientist John Freemuth. Freemuth says everyone involved in this 11-state drama knows the stakes. If the bird is listed, it could have big impacts on ranching and natural resource development. Freemuth says the feds are taking every bit of information into account before the September listing deadline. But despite the population boost shown in the report, the data was collected before this year’s fire season. Freemuth says with wildfires eating up chunks of key sage grouse habitat in states like Idaho and Oregon, it is not clear yet how many birds may have been affected. Idaho Fish and Game says it will allow hunters to shoot sage grouse next month, despite a multi-state effort to boost the bird’s numbers. WildEarth Guardians accuses the Bureau of Land Management in Idaho of removing nearly 4 million acres from a previous plan to protect sage grouse habitat, and not being transparent about it. The environmental and wildlife advocacy group wants to see the threatened bird listed under the Endangered Species Act. In September, the U.S. Fish and Wildlife Service is set to make a decision that many in the West have been anticipating for years. The federal agency will decide whether to list the sage grouse under the Endangered Species Act, a move that many groups in states like Idaho want to avoid.